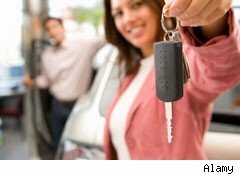 Getting a new car can be an expensive expenditure, but there are ways to save money in the process. Here, our experts break down the costs of buying versus leasing a new vehicle. When it comes to purchasing a new car, you'll likely be financing (unless you are paying in full). Initially, this requires a down payment of 10 percent of the price of the vehicle, plus sales tax. That means you'll need to have anywhere from $5,000 to $10,000 up front. Leasing is far less costly. You'll need to pay about $1,000 to $2,000 in fees, have the first month's payment and pay a security deposit. However, lease agreements are negotiable, so you may be able to get out of paying the security deposit, as well as some of the processing fees. In addition to lower up front costs, monthly lease payments tend to be lower than financing payments. So, in general, leasing is the best deal -- that is, if you're only in it for the short run. Those who are only interested in having your car for two to four years will benefit from this option the most, since it leaves you with lower monthly costs and more cash on hand. Keep in mind, though, you won't own anything. If you're in it for the long haul, savings are on your side, too. Those who plan on having their car for seven or more years will be happy to know that by then the cost of ownership falls below the cost of leasing. So either way, it's a win-win. Just evaluate which situation suits your life best and you'll be on the road to savings.